This site has been set up to raise fund's for our beautiful little boy who had a very traumatic start in life and was not expected to live, but against all odds he did but unfortunately he was left with serve cerebral palsy, and is unable to sit walk or talk and finds it very hard to eat so will be going for an operation very soon to have a feeding tube put in his tummy, Nathan also has involuntary movements. As my little boy is now becoming a big boy things are becoming really difficult and very hard for us to carry him up and down the stairs, and lifting him in and out the bath is becoming nearly impossible, so we need to have major adaptations to our home and specialised equipment put in for him so we can care for him safely. But all this comes to well over £40,000. We get a grant through the government but it only covers a fraction of the cost, we as a family are doing as much as we can but we are still about £13,000 short, which is about the cost of a through floor lift which he desperately needs so he can get access to his bedroom and bathroom safely. The lift would also mean that Nathan would not be left down stairs at night on his own away from the rest of his family. We feel if Nathan was left down stairs on his own he would be very scared and frightened. If you feel you could help in anyway whether through fundraising or a small donation it would be very much appreciated. This is Nathan after they removed his breathing tube and replaced it with a nose tube which gave him a little oxygen but he was breathing mostly on his own, what a little fighter he is! As you can see my poor little man's body and face had swollen right up, not sure why this happened just think his body had been through a very traumatic experience. this was to help slow the body down so the oxygen can get back into his blood to minimize any further brain damage. 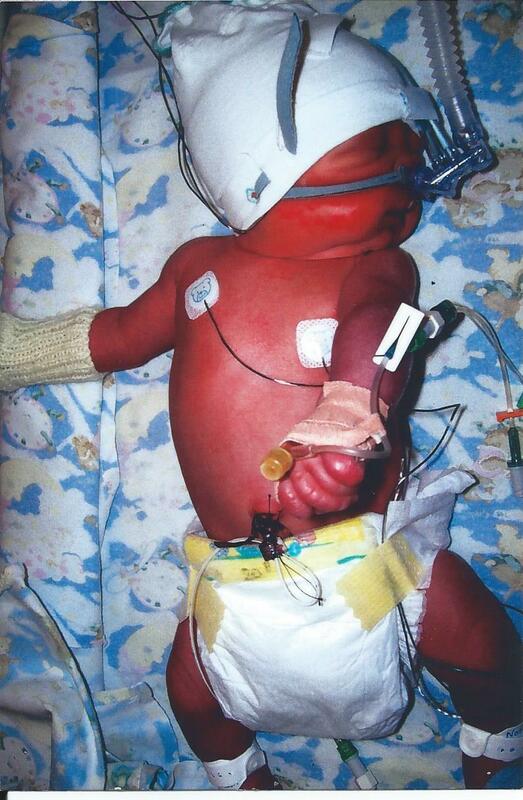 Nathan was born not breathing and it took 26 minutes to resuscitate him. 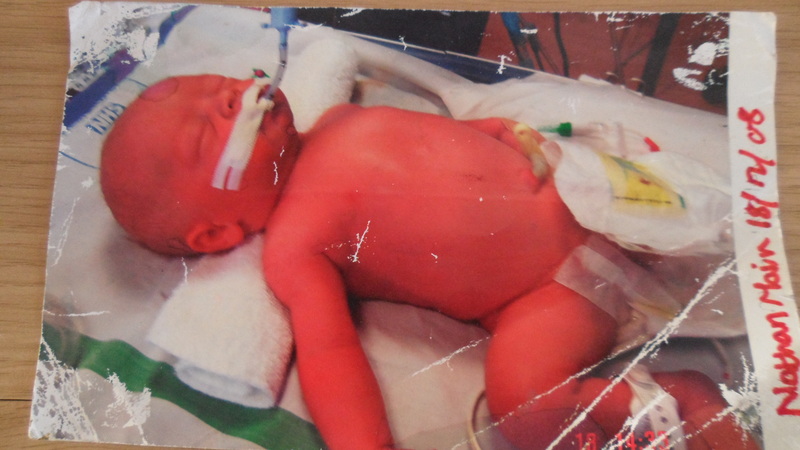 This picture was taken a few hours after he was born, the next day we were told he was not going to survive and they were going to take out his breathing tube as that was the only thing keeping him alive, but as you can see from the above picture he surprised everyone! 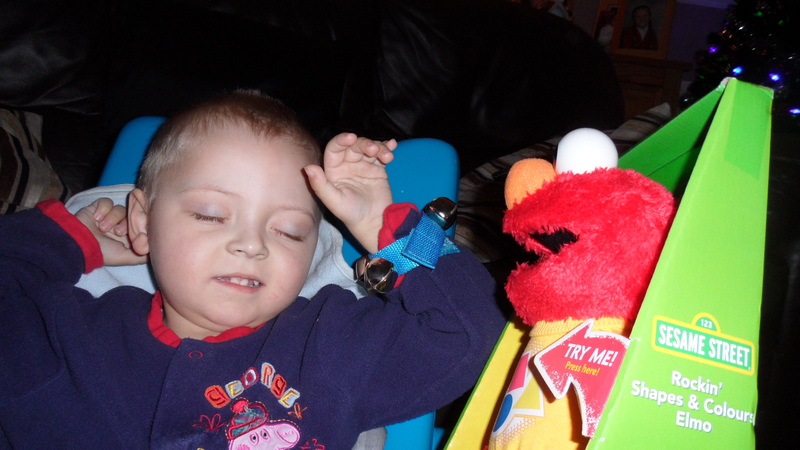 This is Nathan on Christmas morning looking at one of his new adapted touch button toys (Elmo) who he loves. As Nathan has poor hand control these adapted toys are great and a lot easier for him to use. 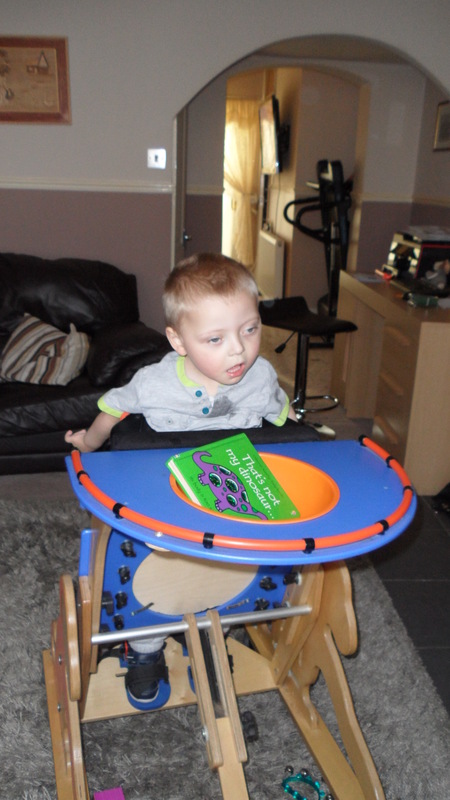 This is Nathan in his standing frame, this is to help build strength in his legs and tummy area, he can manage about half an hour at a time now before his head control becomes a problem.